We examine the drivers of the convergence of the hourly wage distributions of males and females in Israel between 1995 and 2008. Israel is an interesting case study in this respect, since it experienced declining wage inequality in recent decades, as opposed to most developed countries. We found that the gender differences in both average wages and wage inequality declined over time. In particular, average wages increased faster for females than for males, while wage inequality declined faster for males than for females. We decomposed these distributional changes into the contributions of worker and job attributes, the returns on these attributes and residuals using a Shapley approach applied to counterfactual simulated wage distributions. We found that most of the increase in male wages was due to the increase in wages of workers in high-wage occupations and industries, while female wages increased mostly due to the increase in the returns to experience. 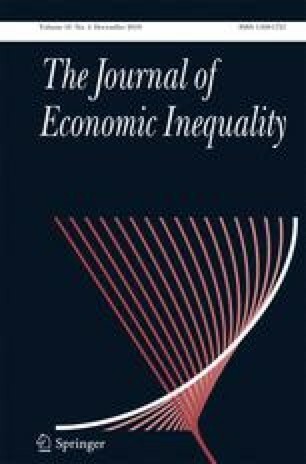 The decline in wage inequality was driven mostly by changes in attributes, the decline in the returns to education, and the catching-up of immigrant workers, and each of these components was stronger for males than for females. We conclude that the convergence of the male and female wage distributions was due to both changes in the supply of labor, especially among females, and changes in the demand for labor leading to changes in the returns to various skills. The online version of this article ( https://doi.org/10.1007/s10888-019-9406-5) contains supplementary material, which is available to authorized users.